Who will be „DT Aftermarket World Champion 2018“? From June 14 until July 15, 2018, the World Cup in Russia takes place. 32 teams want to become the next world champion and fight for the World Cup trophy – and in a new edition of the tip competition the product brand DT Spare Parts is looking for their "DT Aftermarket World Champion 2018". Participants have the chance to win attractive prizes at the "DT Aftermarket World Champion 2018" tip competition – join quickly now! This is how it works: The participants register and submit their tips before each game of the World Cup. Whoever reaches the highest score after the final on July 15, 2018, will become "DT Aftermarket World Champion 2018". If there is a tie, the lot decides. The legal process is excluded. Important: For a high chance of winning you should place bets on all games of the entire World Cup. You can also submit or adjust your tips until just before the kickoff. By the way: Anyone who already has participated in the previous tip competitions for the European Championship 2016 and the Champions League final round 2017 can register with their previous access data. You have the chance to win attractive prizes worth a total of 5 000 euros. The "DT Aftermarket World Champion 2018" spends an unforgettable football weekend in Munich with a companion of his choice – including flight, overnight stay at a hotel and two VIP tickets for a game of FC Bayern Munich in the 1st Bundesliga in the Allianz Arena. 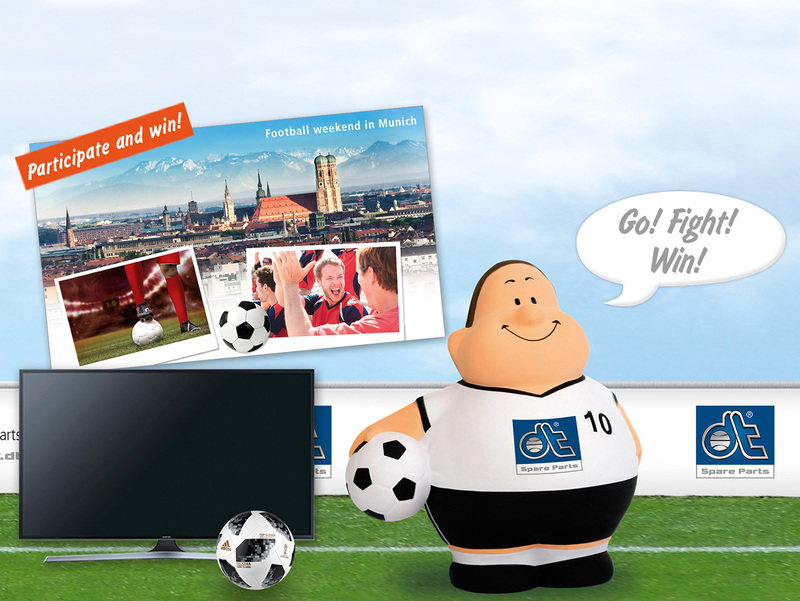 The runner-up wins a flat screen (OLED) – so that the next football matches will be an optical highlight at home. For the third place there is a high-quality digital camera. The fourth place will get a gaming console including the game FIFA 2018 with World Cup mode. And to the participants who finish in fifth to tenth place DT Spare Parts gives the official FIFA World Cup football “Telstar 18” from Adidas. Now it's time to sign up, hand in the tips and in the end win the virtual tip trophy as "DT Aftermarket World Champion 2018". DT Spare Parts wishes a lot of fun, success and good luck!